Medievalists have long considered topics of cultural contact such as antagonism or exchange between western Europe and the Islamic world, the west's debts to Byzantium, European expansion during the Crusades, and Mediterranean trade. Medieval Cultures in Contact grows out of such traditional themes of European identity and its relations with others, but its essays pose new questions and view the topic from different perspectives. In recent generations, the study of non-European cultures for their effects on the west has changed to consideration of diverse medieval cultures as separate and worth studying on their own. The change is due in part to the influences of other disciplines, such as comparative literature, the social sciences, and subaltern studies. With the increased interest in such groups, cultures in contact is no longer necessarily European contact with one group or another, with Europeans the common ground in each encounter; it now extends to a much wider range of cultures and their interactions. 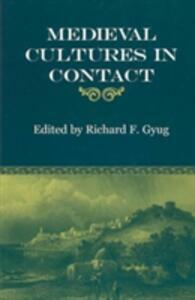 The approach to cultures in contact running through many essays of this volume is that the meeting of cultures promotes historical change in the original societies and creates new societies at the point of contact. The medieval world was rich in the meeting of cultures that created new circumstances and results, some based on borders between cultures, others on internal reactions to contact. The essays in Medieval Cultures in Contact consider many diverse locales, periods, and protagonists in which or on whom the meeting of cultures was formative. The topics include the origin of western Christian culture in Bede's England, the contact of east and west in the Islamic and Asian worlds, the western perceptions of the east in German literature, and cross-cultural influences in several Mediterranean regions. The relations between the Christian majority and the culture of the Jewish minority in northwestern Europe, and the interaction between the occupational cultures of minstrels and clerics are related issues. The second section of the volume presents two models for teaching cultural contacts in the middle ages: one discusses the need to recognize such interactions as part of medieval history, and two linked essays show how literary diversity has been treated in practice.